Looking for the best quick lunch spot in downtown Vancouver? Bel Cafe, owned by top Chef David Hawksworth, just might be it. ‘Cutthroat’ best describes Vancouver’s sandwich scene. No longer is the popular lunch food built by ‘sandwich artists’ as often as they’re created by accomplished chefs using fancy ingredients and hard-to-cook meats. So coveted are these creations, that, more and more often, you’ll find them on dinner menus around the city (think Bao Bei’s Shao Bing). David Hawksworth — whose informal new venture is named after his wife Annabel (how charming!) 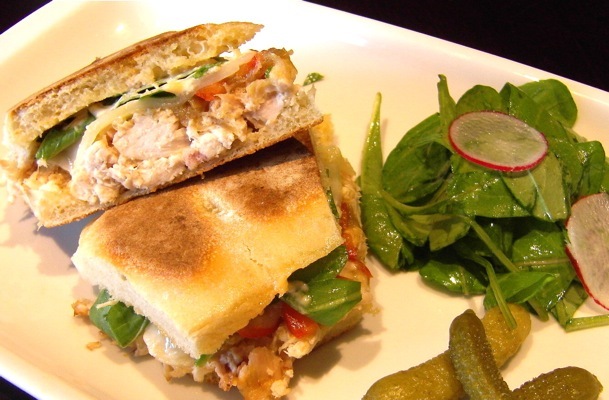 — has given this city another reason to lunch out with his Spiced Pulled Chicken Sandwich. Absurdly tender chicken — draped with finely sliced caramelized onions and a melting slab of buttery provolone — lay between thin, toasted house made ciabatta bread. Despite the item’s name, spice didn’t hit my palette. No complaints here, however — the sandwich was creamy, rich, and fully to die for. Equally satisfying were my impeccable, stylish surroundings. Bel Café is where you want to be.